Gold is looking north ahead of the FOMC rate decision tomorrow as the US central bank is seen raising the rate by 25 bps. However, and more importantly, the markets believe that the Fed will adopt a wait and see approach next year and that is weighing on the greenback negatively letting the yellow metal gain back its allure as a safe haven. Gold has recovered as expected from Friday's sell off as prices are back just below recent highs. The price is currently testing the $1247.5 resistance level and a break above it looks more probable to happen. 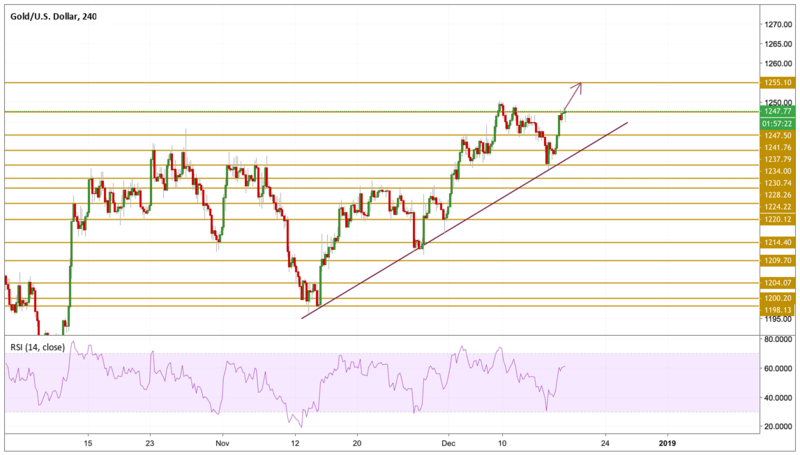 Once the break is confirmed, we will be focusing on the $1255.1 resistance level as the momentum is looking bullish and far from overbought conditions.